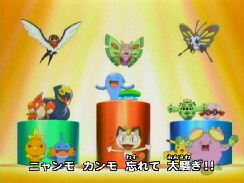 This is the second ending theme for the second Pocket Monsters series, as well as the main theme for the first Advanced Generation mini-movie, Odoru Pokemon Himitsu Kichi. Nitchi mo satchi mo douni mo Runpappa! Douseko no yo wa hojaraka hoi hoi! Gakkou mo kaisha mo hogaraka hoi hoi!